Disneyland. The happiest place on Earth! Whether it's your first visit or your thousandth, Disneyland does not disappoint. 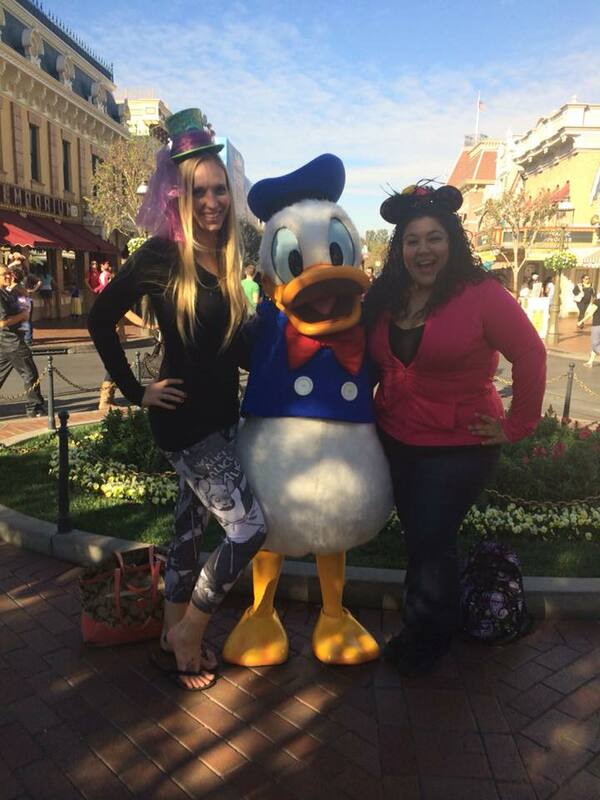 Wondering what you should do with your limited time at Disney? 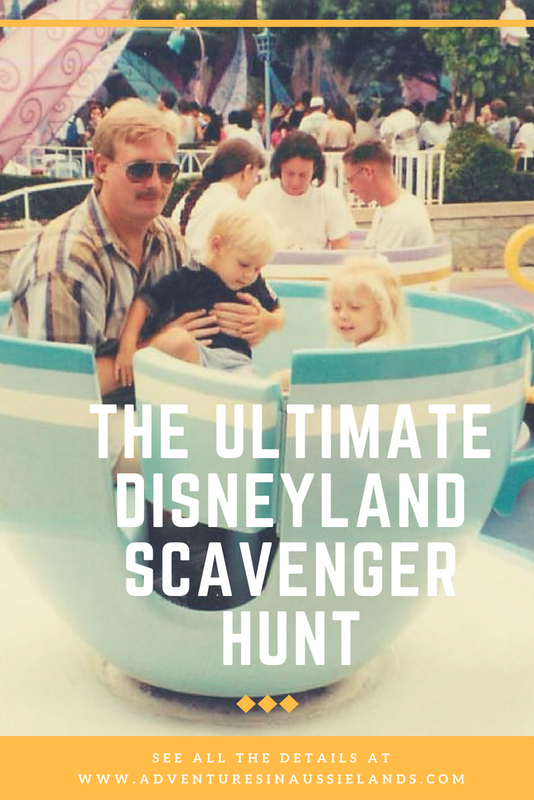 This scavenger hunt will help you have a magical day. Be sure to use the hashtag #AdventuresinDisney to help us keep track of your adventure! Mickey Mouse and Donald Duck. Two of the most iconic Disney characters. Getting a picture with Disney characters is fun. But engaging with them can make your trip that much more magical. Sometimes the line can be wrapped around Main St. So if you're rushed for time you can often catch these two characters in other areas of the park and California Adventure. This can be done by riding all the mountain rides in one day: Splash Mountain, Space Mountain, the Matterhorn, and Big Thunder Mountain. If you're there on a busy day, utilise your fast passes, or single rider passes to ensure you get to all four. There is nothing better while waiting for your turn in the Tiki Room than enjoying a Dole Whip. I'm pretty sure a whole list on how to eat your way around Disney could be put together. But if you're on a budget or unsure where to eat, Dole Whip must be on the list! This nondairy treat won't sour your tummy for the rest of the fantastic Disney food. If you're trying to get the best first glimpse of the park, sitting in the nose of the monorail will meet this expectation. Not sure how to access this coveted seat? Just ask a cast member. There may be a bit of a wait so make sure you're structured this time into your day. Disneyland is one of the few places on the planet where it is perfectly acceptable to wear matching attire, and it be magical af. 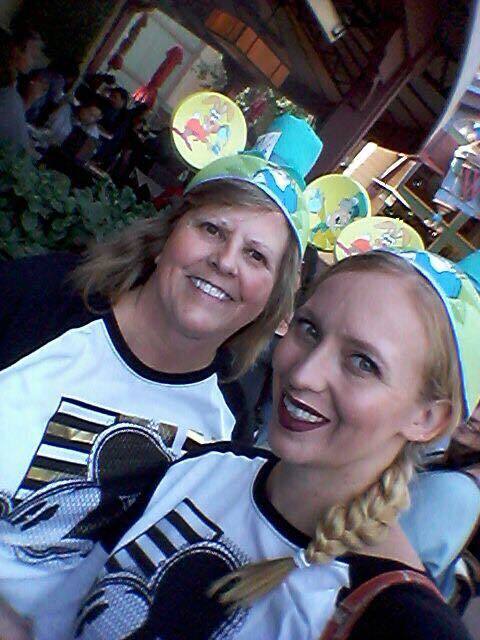 It doesn't matter how old you are, if someone asks you to wear matching ears or attire at Disneyland, you bloody do it! While on Big Thunder, you will see a goat with TNT in its mouth. Do NOT take your eyes off this goat. This little trick will give you a whole new perception on the ride. Apparently, if you sit in the very back, you feel it a bit more. I've heard that intensity can vary based off whether you turn just your head or your whole body. Sit in the back, only follow the goat with your head, and it'll be a whole new ride! 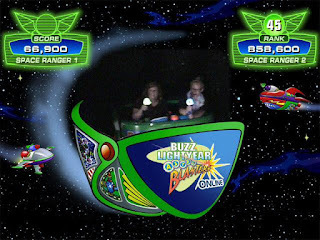 Riding every ride in Disneyland is not an easy task. It takes heaps of time management and a super early start (unless you manage to make it to the park on a quiet day). Celebrate your massive accomplishment by snapping a picture on/near every ride. Please read the caveats at the bottom of this post. I ranked 45th at the Park that day! Yup, you can go to hell at Disneyland. Go to Mr Toad's Wild Ride and hop onto a motorcar. As you zigzag through the town, get sentenced to jail, and then break out, you'll find yourself going head to head with a train. Where will you end up? Heaven or hell? Who doesn't love singing along to the Pirates song? It's pretty much a ride tradition. Break that tradition and be bold. Sing the Gilligan Island's theme song or better yet, sing 'I'm on a Boat' by Lonely Island. Cuz I'm on a boat, and it's going fast, and I got a nautical theme pass me the afghan. The Mad Hatter is always sharing riddles. Surprise him with your best joke. 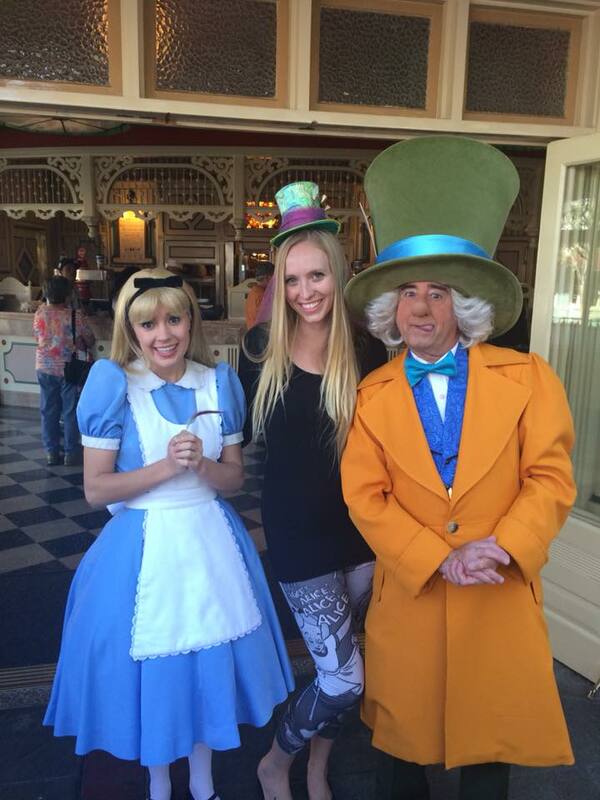 Bonus points if you can get the Mad Hatter and Alice to laugh. Not sure where to find the Mad Hatter? He can often be seen in front of the Tea Cups or Alice in Wonderland ride or at Refreshment Corner on Main Street. Not only do you want to be the first one on the boat, but you also want to be the first one to ask a cast member. You'll be directed to a door that says 'private'. Once you knock on the door, you'll be greeted by the captain. Here you'll be allowed to steer, ding the bells, and blow the whistles. Make sure you say thank you to the captain and the cast members that helped you. This is one of the most overlooked areas of Disneyland. Let your inner child run loose exploring the island, looking for pirates treasure. You might even get a cheeky picture with Captain Jack Sparrow. 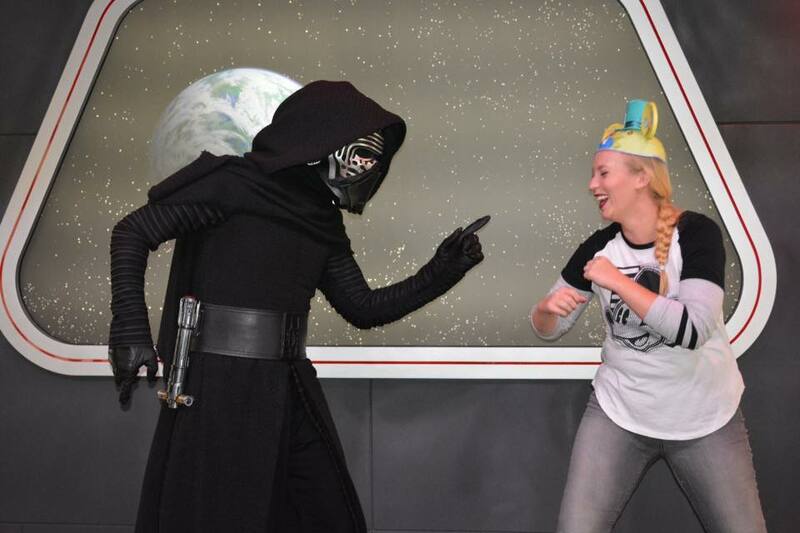 When visiting Kylo Ren or Darth Vader, don't be afraid to show them what you got. Challenge the Sith to figure out who actually is the most powerful person in the galaxy. You may end up with a hilarious photo like the one below. Kylo asked to see my fighting skills, and I was unprepared. Are you feeling uber romantic? Are you catching the sights with your kiddos or your favourite niece/nephew? Are you spending a fun day with your besties? Or are you just super bold and wanting to potentially meet your soul mate? Grab a partner and give them a smooch on Main Street. It's too iconic to pass up! This one may be a bit hit or miss, but it wouldn't be a scavenger hunt if there weren't at least one super challenging item on the list. The Jungle Cruise almost always has decoders however, Indiana Jones does not always have them. This is one of the most underrated attractions in Disneyland. No, it is not an epic ride like Space Mountain, but it is a great little history lesson with a pretty dang cool President Lincoln. 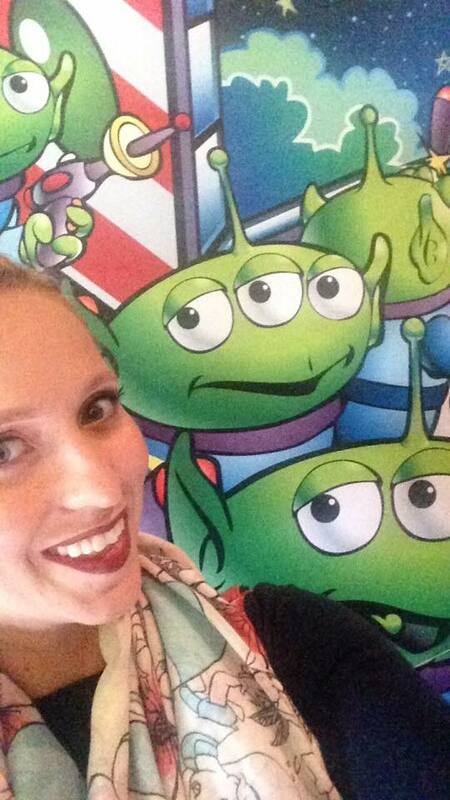 Get a sweet selfie with Lincoln for bonus points! I. Literally. Dream. About. Disney. Churros! 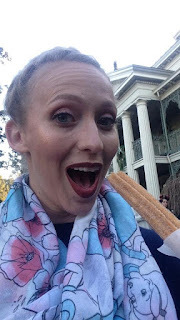 Eating a churro at Disneyland is one of the easier accomplishments on this list plus it will give you a boost of energy if you're starting to hit the afternoon lulls. It's a great way to help the lines go by a little bit faster as well. Not sure if you can still find corndogs in Disneyland or if you might have to sneak over to California Adventure but dang they are one bloody good corndog. Definitely worth the park detour. If you know where you can find a corndog in Disneyland, please share it in the comments below! Taking a picture with the Disney Princess' is great but let's challenge ourselves just a little bit. It's time to be extra af and sing to Ariel that you want to be part of her world. Belt out 'Let It Go' with Elsa. Or sing at the wishing well with Snow White. After you've finished singing with Snow White, be sure to make a wish in the wishing well. It will help make your Disney adventure that much more magical. If you've managed to complete your scavenger hunt, hop on over to California Adventure, try a Mickey's Fun Wheel, and start your California Adventures Scavenger Hunt. Bonus: Ride every single ride at Disneyland and California Adventure. Bonus bonus points if you can do both on the same day. When you visit Disneyland, what are your must do's and must see's? Share this post with a Disney addict. Use #AdventuresinDisney so I can keep track of all the Disney fun! *For the love of all that is holy, please PLEASE do not risk the safety of yourself or others to take a bloody selfie. Take it in line, in front of the ride, in the car before the ride takes off but DO NOT actually snap the dang picture on a ride that could cause serious harm. Adventures in Aussieland will not be held liable and does not condone risk-taking behaviour. Liked this post a lot! I'm actually planning on visiting Disney World this summer and this has me even more excited to give that one a try. Yay! I hope you enjoy your trip. You'll have to share how you went with the scavenger hunt. Awesome list! Dole Whip in the Tiki Room is a must for me . . . I can't do a Disney trip without doing both of those, so two birds with one stone! Exactly! It's a pretty iconic stop on any Disney visit! What a fun list!! I've been to Disneyland a billion times and have never told a joke to the Mad Hatter or have heard about decoders. Thanks for sharing. Oh wow what fun!! We havent taken all of ours to Disneyland yet although I think we are going to go for Christmas, I would love to do something like this! Christmas time might be a little challenging to do everything on the list because of how crowded the park tends to get but it would be super impressive to at least give it a go! Good luck and enjoy your trip! I just went to Disneyland for the first time in June and I am laughing you said you could go to hell there and I thought you were going to say the Mission Breakout/Guardian of the Galaxy ride. That felt like hell! Ohh I love all of these! We got most things crossed off our bucket list but there are a few on here we didn't get to do in the short time we had. Oh, well! Guess that means we'll just have to plan another trip!